In case you’ve spent the year so far living under a rock, we are now officially living in Marty McFly’s future. 2015 isn’t exactly the way Back to the Future portrayed it back in 1989 – we’re a little late on the mass-produced hover boards – but at least it contains Keith Lemon. Keith Lemon’s Back T’Future Tribute helped break channel records when it aired recently as part of ITV2’s Back to the Future celebrations, airing on ITV2’s best ever day and drawing a whopping 1.2 million viewers. The smash hit documentary sees Lemon and celebrity pals such as Paddy McGuiness and Gino D’Acampo recreate some of their favourite Back To The Future scenes. Lemon also travels on a pilgrimage to visit the film’s iconic locations, members of the original cast and crew and the superfans. Now, TVGuide.co.uk is giving fans the opportunity to win one of three copies ofKeith Lemon’s Back T’Future Tribute on DVD. It’s not just any old DVD however. Inspired by Keith’s words, we’ve got our hands on three very special limited edition DVDs in totally authentic VHS-style packaging. All fans have to do is answer the simple question below and enter their email for a chance to win the limited-edition DVD of Keith Lemon’s Back T’Future Tribute. 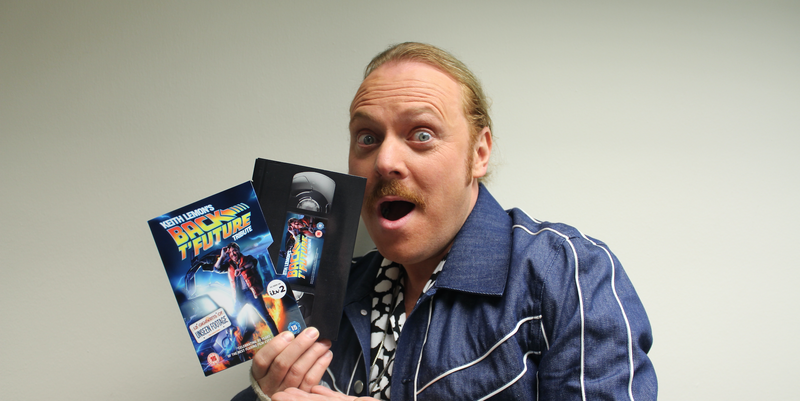 Keith Lemon’s Back T’Future Tribute is out now on DVD and Digital HD through Universal Pictures UK.